The SMX Shoes & Bags SALE is here! 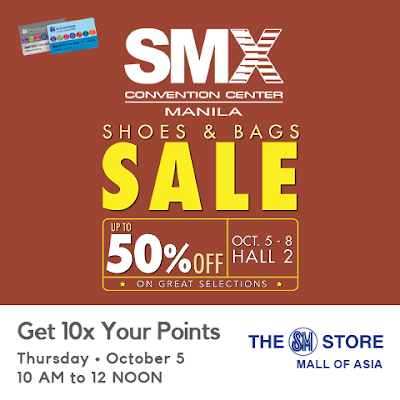 Enjoy up to 50% OFF on your favorite shoes, bags and luggage brands from October 5-8 2017 at SMX Convention Center MOA Complex. Skechers • Puma • Saucony • Merrell • Pony • Brooks • Fila • Reebok • Sperry • Keds • Barbie • Chicco • Elle • Fisher Price • Samsonite • American Tourister • High Sierra • Targus, and more! SM Advantage, SM Prestige, and BDO Rewards cardholders get 10x their points on October 5 from 10am to 12nn.